Home Mobile Tech Companies Top 10 TOP 10: World's Mobile Manufacturing Companies till 2012. 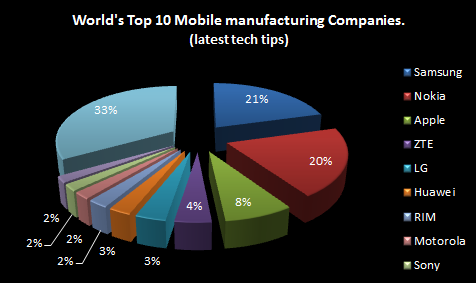 TOP 10: World's Mobile Manufacturing Companies till 2012. 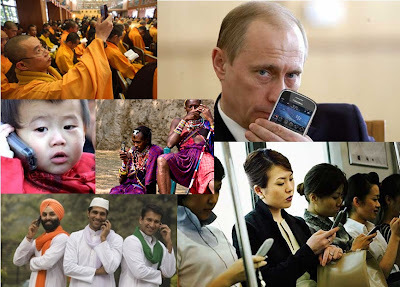 Its a no brainier that Mobile phone industry is going to be the leading industry in the upcoming decade. We have seen state of art Innovations from iPhone to Android devices and the competition is really heating up. Its surely going to be survival of the fittest. Recently we also saw that Nokia lost its top position mainly due to poor decision making first in getting rid of Symbian OS and then collaborating with Microsoft for Mobile OS. These are based on Q1 2012 numbers. With 1.8% market share and selling close to 7.7 million handsets HTC is at number 10. Sony got rid of Erricson to give out a clear message that they mean business when it comes to selling smartphones. Sony sold 7.9 million handsets and is at number 9. Motorola mobility was acquired by Google to help it fight all the patent wars across the world. Motorola will soon see an upward trend due to this acquisition. At the moment Motorola is at no 8 after selling 8.37 million handsets. RIM is fighting its own battle for survival. RIMs poplar service Blackberry is generally recognized as a service for a very premium customer base. If that's the case they should be happy with staying at #7. They have sold around 9.94 million handsets. Many of us are really not aware of this company. But being at no 6 in the world is no easy thing. Just in case you are curious here are some of the mobile produced by huawei. Huawei has sold 10.8 million handsets. LG most popular smartphones are Optimus Black based on android. They have sold around 14.72 million handsets. Just in case you want to know all devices from ZTE here is your link. ZTE has sold 17.44 million handsets. Apple is at no 3 hear based on units sold. However Apple is the No#1 Company when it comes to revenues and has a market cap of 500 billion dollars. Clearly they make more money with lesser handsets sold.Apple has sold 33.12 million handsets. Nokia was at the number #1 spot till recently when Samsung powered with its Android Smartphones entered the market and took everyone by surprise. Still Nokia is at no 2 spot here but they are making very less money with each mobile they are selling. Nokia is close to getting closed down. With 83.16 million handsets sold Nokia is at no 2 spot. The new number one spot is acquired by Samsung and clearly Samsung is here to stay as Nokia has a policy paralysis and they do not want to embrace Android OS. With 86.57 million handsets sold in a single quarter and more to be sold with its Galaxy S3 Samsung is the undisputed No 1 in handset manufacturing business. It is very interesting to see how this category of handset manufacturers are getting the slice of Pie all combined others have sold 139 million mobiles across the world.